The Harnett Tank is my evening tv project. It's knitting up fairly quickly with just a little work each night. It was supposed to be my Arrested Development knit, but I've found the new season so blah my husband and I haven't even finished it. I moved on to a show my brother mentioned to me but seemed a little embarrassed to admit to watching- Orphan Black. It's not family friendly, but it gives me a sci-fi fix. My question is- if a guy is seen watching Downton Abbey how can anything else ever embarrass them? 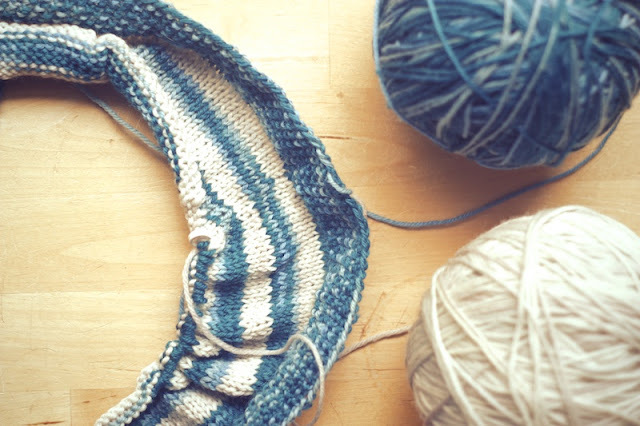 I wasn't sure I'd like the way the Stroll Tonal yarn knit up in stripes, but it's really growing on me and I think I prefer it to alternating solid colors. It makes me think of the days before I had tried hand-dyed yarns and only saw other ravellers' projects knitted from them. I was blown away by all of the color possibilities outside of my chain hobby store yarn. The only thing I have to watch is making a smooth transition with jogless stripes by slipping the first stitch of the round if it was also a decrease stitch. 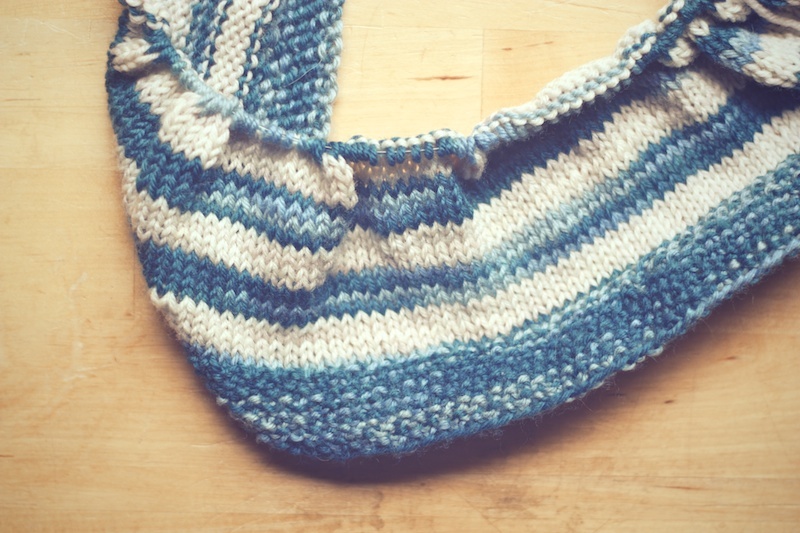 That's the one drawback to stripes, and I'm not entirely happy with the way I'm managing that, but I think I can smooth out any goofy stitches with blocking. That will be sooner than these photos show, because I'm actually to the bust increases. It is moving along. I felt the same way about arrested development at first. It gets better as the storyline is unveiled, and is definitely funnier the second time around. Doesn't beat the original though, but I'm not sure anything ever will! Well, episode 9 where Tobias directs the musical is pretty funny! We'll get back to it soon. I just hate to see the best comedy ensemble not reach its full potential, but maybe its setting the stage for good things to come. I also felt the same way about AD! But, there are some great episodes further on in the season. Also, not that it helps, but the reason they are filmed as one-character-centric episodes is because all the actors were booked already, so they had to film around everyone's schedules. That's the bad part about it being "just" a Netflix show, I guess. Oh well, it's all just leading up to the movie, anyway! It actually does help, Katie. I could not understand why they would mess with the perfect formula, but now I get it. Oh, good! I'll give you all the entertainment industry inside news!